The autumn storms have been many this year, but beautiful autumn days can still come, to go roaming on the seashore. 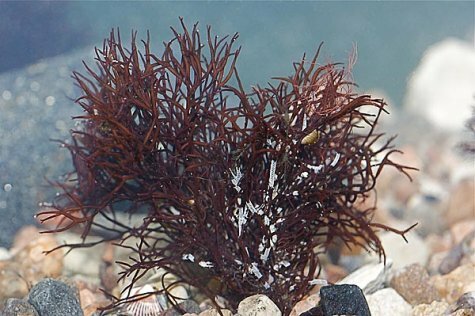 The Furcellaria or black carrageen is our only edible seaweed. Reddish-brown to nearly black in colour it belongs to the red algae group. It can be found along nearly the entire Estonian coast and storms have brought plants on shore. It grows up to some twenty centimetres tall. Each growing branch tip divides into two – none of our other algae show such regularity. Thus identification is not difficult. From the black carrageen furcellaran can be extracted; it is a gel-forming polysaccharide that is used to produce gelling in foods: an additive in marmalades, sefirs*, also in various dairy products. Food packages are in that case marked with the code E406. On hard sea bottoms it can grow attached to bladder wrack, Fucus vesiculosus, in water depths from a metre down to some twenty metres. The so-called drifting or loose-lying variety grows in the Väinameri straits, the seas between the western islands and the mainland, where the seabed is softer. It has a rounded shape with no holdfast but otherwise looks similar.